Want to grow your audience exponentially? I've watched some professional communicators start using Facebook LIVE on a whim a couple of years ago. I personally know them and have followed their growing and learning process closely. They started with a several hundred followers viewers. Within months, they were averaging 5,000 viewers per week. By doing the things in this ebook, they grew their audience to regularly having 30,000 weekly viewers within the 18 months. Then they started inviting special guests/friends to join their broadcasts and their audience expanded to 50,000-60,000 weekly. This is just one case. There are others I can share (and do in the Ready. Set. Promote! program). Would you like to grow your audience? Would you like to do it for no extra expense? You probably have the tools to do so, but just need a few step-by-step tips to help you get started or fine tune what you're doing. 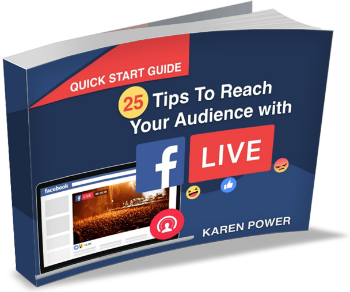 Check out 25 Tips to Reach Your Audience with Facebook LIVE. Also included is a list of examples of real-life users for you to watch how they do their live broadcasts. My friends, in the above scenario, began taking those same weekly Facebook videos and going outside of Facebook with them. This Quick Start Guide will show you how to take your broadcast videos to expand your reach beyond Facebook ... or in my best Buzz Lightyear voice, "to infinity and beyond!" If you have a Facebook account and a smartphone, you have what it takes to expand your audience across Facebook ... and around the world. Your results may vary, but with consistent use of the tips in this ebook, you can grow your audience to thousands easily. Where it goes from there is up to what you are willing and able to do.